As a somewhat newbie to the Civil Service, when I first heard the words “ConCon6” it is not surprising that my first thoughts were of futuristic spaceships and the sci-fi convention “Comic-Con”. While it may sound like the latest rocket heading for worlds afar, ConCon6 is in fact the name of the sixth cross-government content conference, where over 240 passionate individuals came together from various government departments to share their latest ideas and developments and celebrate all things content. While it may not be as large (or wacky!) as the sci-fi conference it brings to mind, it is certainly not lacking in terms of its ambition and interest, with 84 volunteers helping out and presenting their latest content projects to make the day a success. Tickets sold out almost instantly and I was lucky enough to be attending – even if it meant a 5am wake-up call on a cold, dark Wednesday morning in October. Located in the heart of central London, Mary Ward House on Tavistock Place was the location for ConCon6 – an elaborate and intimate Grade 1 listed building just a short walk from King’s Cross St Pancras underground station. Quirky winding staircases showcased the latest content innovations and projects from a range of departments, while grand libraries and conference rooms hosted thought-provoking talks, content-led workshops and a very well-used tea and coffee station. 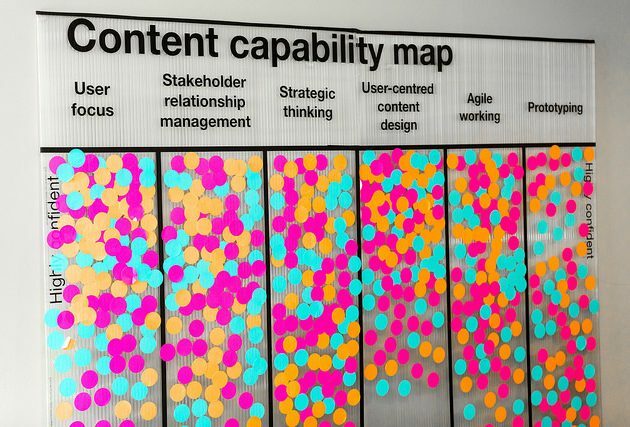 A heat map showing the confidence levels of content designers from across government departments. Image source: Flickr. Image credit: @gdsteam. Image licenced under Creative Commons. After registration and refreshments in the Dickens Library, the day began with an interactive visual task – we were asked to rank our content design skills in terms of our confidence using stickers on a large poster, creating a colourful heat map of the variety of skills we all had to offer. As we all took our seats in the main hall for the welcome talk from Laura Billings and the latest updates from the Government Digital Service (GDS) with Trisha Doyle, there was a great deal of excitement in the room. The session finished with rapturous applause, as we all put our hands together to celebrate the milestone fifth year of GOV.UK and all it has achieved in terms of moving content into one place for the public. As the morning sessions got underway, departments and organisations from all across government showcased the very best of their work, with sessions covering topics such as the Department for International Trade’s ongoing challenges in publishing in different languages, accessibility and assistive technology demonstrations, and user journey and user action mapping to name a few. ONS was also well represented, with Senior Content Editors Laura Churchill and Paul McGarvey from the Digital Publishing Team leading a workshop on “Telling data stories”, helping attendees understand how we are presenting complex information in clear and concise ways to our users. Benjy Stanton, Lead User Experience Designer at ONS, also hosted a session on making tables more accessible through user testing, where he shared the latest ONS findings from this ongoing project. After the morning sessions, it was lunch time and there were two surprises in store. In keeping with the forward-thinking mantra of the day, lunch was served from 170kg of salvaged food that would have otherwise gone to waste. With pastas, meats, cheeses, breads, salads and a variety of colourful humus on offer, it was an interesting touch, polished off with some indulgent (also salvaged!) bread pudding and apple and pear compote. A bag was also placed on each of the tables, containing a selection of conversation cards to keep us focused on all things content as we dined and – more importantly – to get us all talking. Questions ranged from “Is bad content ever OK?” to “How do you think your content skills could help you in a nuclear war?” – an interesting lunchtime discussion topic, that’s for sure! Then it was time for the afternoon’s sessions, which included workshops on Ofsted’s project to cut back on jargon, the importance of agile delivery and content design in improving policy, one-to-one Google analytics support, and understanding the benefits of prototyping (again, to name a few). Paul Boag (pictured) hosts the final session of the day on starting a ‘user experience revolution’. Image source: Flickr.com. 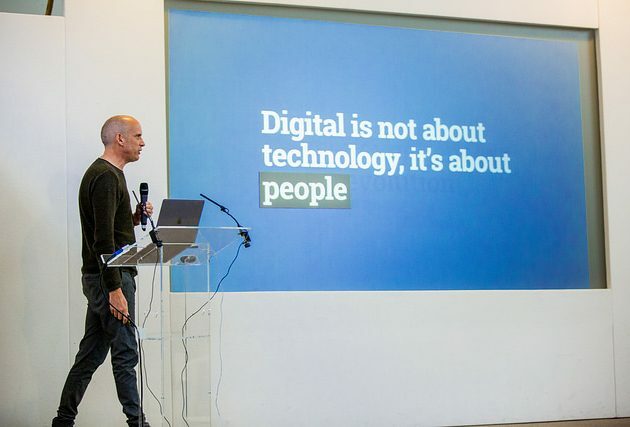 Image credit: @gdsteam. Licensed under Creative Commons. To round off the day, Paul Boag, author of “User Experience Revolution”, gave the closing talk back in the main hall. His enthusiastic character bounced across the stage as he sought to inspire us one last time before the long train journey home. He encouraged every single person to make small changes in their workplace to put the user at the heart of all that we do; he asked us to put images of user personas on the walls, to repetitively ask the question “why don’t we test that?” and to gradually change the culture of the Civil Service to become completely user-focused. It was certainly an interesting and thought-provoking way to end the day. ConCon6’s attendance was diverse and far reaching. Attendees came from 56 government departments from 24 locations across the UK, with two-thirds of participants spending all of their working life on content and the remaining one-third coming from a wide variety of areas, including service design, product management, user research testing, graphic design, analytics and policy. To see such an enthusiastic and diverse range of people coming together to celebrate and promote accessible, user-focused, end-to-end content was refreshing, and a wonderful insight into the growing digital offering and capability of the Civil Service as a whole. As first experiences of ConCon go, mine was certainly a success!